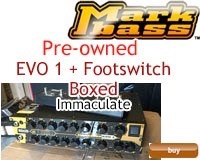 Popular compact bass amps from Italy, the Markbass range features the VLE (Vintage Loudspeaker Emulator) and VPF (Mid scoop, High/Low boost) tone shaping give you fast access to vintage tones and scooped mid tones, plus a very intuitive eq. Popular with jazz and fusion players and those looking for warm, natural tones. Alain Caron Signature 121 Combo £875 - last one!